I disagree, not that a cramped parking lot makes it any better. Best location for pictures was 2 years ago at Mosport. Thats actually a good idea bud the judging will be hard. Only IASCA official can judge SQ with there certain cds they play and a really good ear. Ive been to them before. Needless to say I like the idea. the one thing i say to Randy every year is i would like to see bimmercruise in the summer, but really that, like the food issue is nitpicking. The original date for the show was Aug 24th, but found it conflicted with the Wheels Direct Block Party. The summer weekends are numbered, and larger GTA shows scoop them up. I try hard to plan it on a weekend without any SCCA/BMWCC & ricer events. Turns out that it rained on Aug 24th! If things indeed go forward with TMP, it will definitely be a mid-summer event. I have access (a certain maXmember actually) to possibly getting the event IASCA sanctioned for proper judging. That is a great idea and will definitely be implimented next year. what are the criteria's that the judges look for in either the mild to wild category? just want to know so i can look into them for next year. Hate to say it guys, but the more money spent on mods, the more points you get. Doesn't matter how tasteful they are. That's why we have "specialty awards" for judges favorite vs. point-spread. You can buy an '84 318i for $250, order every Motormaster accessory and probably win E30 Mild. Oh ya, also when you enter a show, you should find out how it is scored in advance!!!!! A big thank you to Randy and all of the people that contributed to this event! It was great meeting some new faces and I had a blast as always! 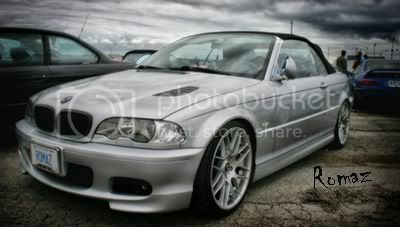 Just wanted to thank Randy and everyone else involved with bimmercruise. The one thing I had a problem with at the show was the amount of people not willing to enter their 20,30,40,50k cars for a cost of $20. These shows can't happen without the support of sponsors and competitors. Just because you see another car with more mods doesn't mean you should drive away. Next year I hope to see more people competing. Plus, it was my first b/c. But next year, when I actually have rims, it will definitely be entered. Just remember that there are different classes so that a car with rims and stereo won't compete against a super/turbo charged car with the same mods, hence the mild and wild classes. Thanks to all that entered even though they thought they MIGHT not win a trophy.